I tend to gravitate towards feminine styles more than anything else – which is why I was thrilled to see ruffles making a comeback on the Spring 2013 runways. I’ve slowly been adding a few ruffled pieces into my wardrobe (this top was the first). So, when I came across this mint blouse, I fell in love with it & just had to order, even though it was technically “petite” sizing (tip: I ordered up a size & the fit is perfect!). I couldn’t resist matching these pieces to my new flower necklace for a sophisticated but fun ensemble. Add a white blazer on top and this is the ideal summer office attire! Gahhhhhh!!! I LOVE that top! SO cute!!! I always see things available in petite on ASOS….maybe I should start trying to order up a size!!! Absolutely gorgeous! Such a feminine and polished look. You look beautiful.. Love this outfit! That is a super cute top! I really like the color on you, and I love the pleated detailing on your pants. It makes them look dressy and very feminine. As always you look great! Wow! This is just perfection! 🙂 Like the top! You look SO beautiful as usual! I am obsessed with your outfit as always! I love ruffled anything!! You always look beautiful! the necklace and shoes are perfect! Looks beautiful Kimberly! I'm always looking for new work attire. Thanks for the inspiration! That top is so pretty and feminine and the mint color is so perfect for summer. Love the shoes too! Love girly pieces but your ladybag and necklace pull it all together! Love this color combo! This is SO pretty! I love these colors together and those white heels. Gorgeous girl! This post leaves me wanting (a) that shirt, and (b) gelato. Mint looks so beautiful on you! 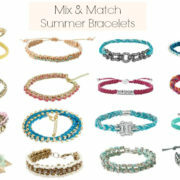 Love this color combo for summer! 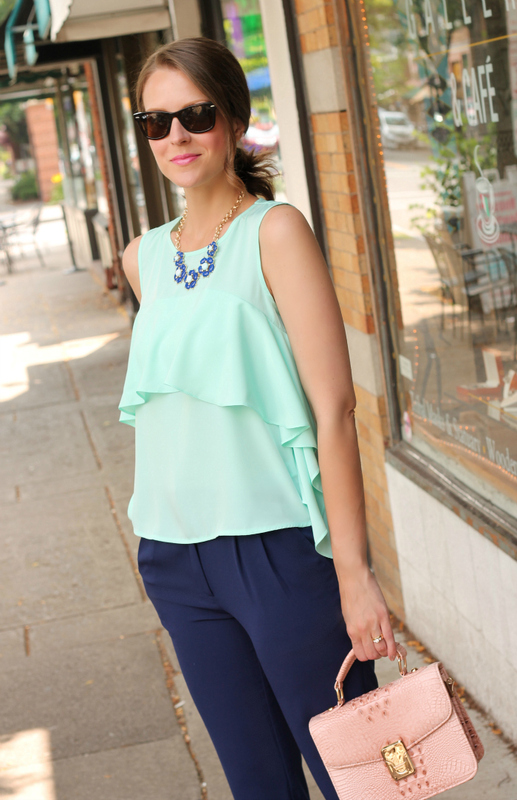 Gorgeous mint top and it's beautiful with that necklace! Love the candid feel of the backdrop. So quaintly Americana and summertime perfect. The colors are lovely and I just have to say did you plan for the Gelato sign to work out as such a pretty accent? Beautiful! Love the style of this top. Beautiful color on you. That top is so cute!! And paired with those pants is perfection! I love that necklace and the color of your top! Loving this necklace and those pants! OMGI love the navy slacks and the white shoes! That top! Wow….the color and ruffles…perfect feminine look! Everything about this look screams, "I want this entire outfit!" So effortless. I LOVE mint and navy together! Plus, that top is perrrrrfection on you. Such a great tip,ordering up a size in petite on Asos! I always see things on clearance and pass over them because I'm quite tall and assume they won't find tight! Great styling and uber feminine! Love this mint green top! Love, love that top. Such a pretty outfit. I'm right with you, I definitely gravitate toward feminine pieces as well. That top is simply adorable, and I just love the colour! I love how mint is still very in this summer! The soft pink purse is just perfect with that flowy shirt & the necklace really is a statement piece! Love it all ! Beautiful! Your top is lovely and your necklace and cute handbag just create such a perfect look. Love you in this outfit! So so pretty! hair looks gorgeous like this! love the outfit too.